Just a quick up date...Keeper of the Honey House has been spoken for, so she is no longer listed on my etsy site. Thanks Julia! This baby's name is Keeper of the Honey House. Several years ago I was working in my studio listening to a book on tape, A Country Year: Living the Questions by Sue Hubbell. 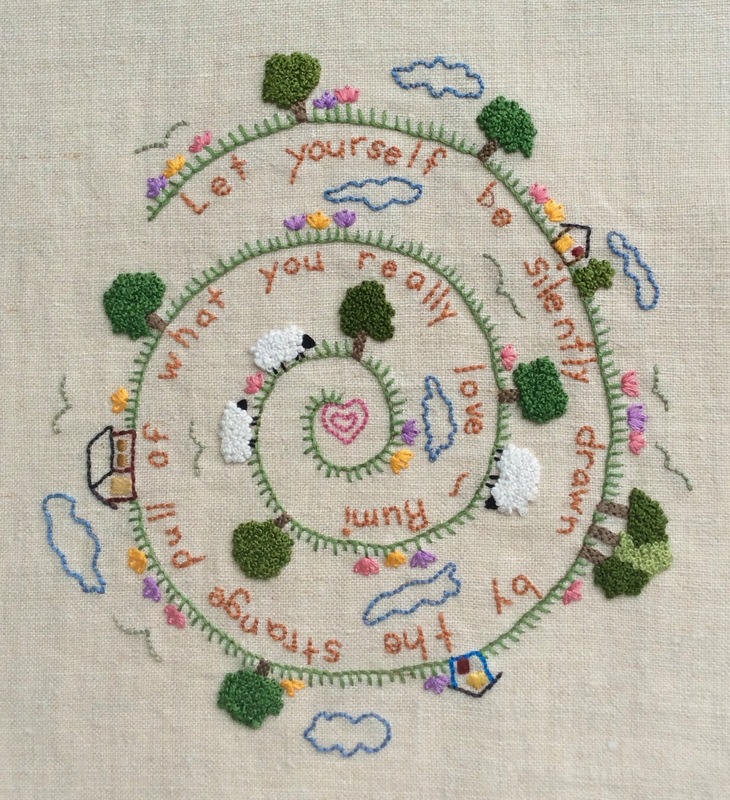 As I was happily listening and stitching along I heard the phrase 'keeper of the honey house.' It stuck with me and I wrote it down in my sketchbook. Awhile later when I didn't know what to work on I was perusing my sketchbooks and saw this phrase and ideas came flooding into my head. She truly became a guardian of those productive, buzzing insects because they started appearing in my studio. Fortunately, they left me alone. Her skirt is made using a basketry technique called coiling. 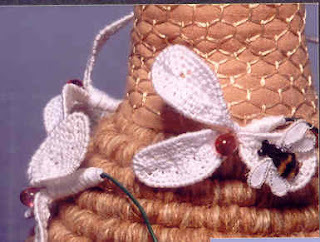 I used several golden shades of wool and linen yarns and wrapped them around a thicker cord and created a bee skep shape. The flowers on her skirt are needle lace around wire, so they can be shaped and the stems are green telephone wire that weaves in and out of her skirt. 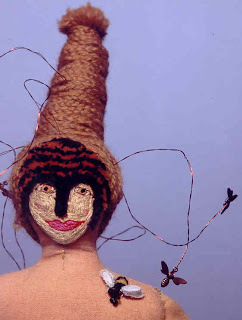 The small bees that dot her body are hand-embroidery and stumpwork wings embroidered on organza are attached. 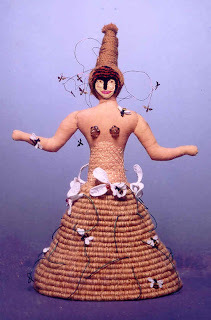 Her torso and head are made of hand-dyed cotton and the torso has a honeycomb pattern embroidered onto it. Her face is one of my favorite techniques, full coverage embroidery. Her hair is a fabulously tall bee hive doo!!! She also has some small bees circling her head like a honey bee halo. 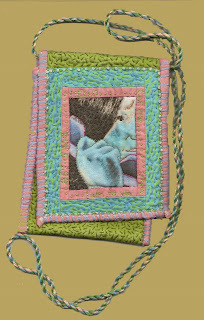 I belong to a fiber arts group (we are trying to come up with a name, but for now we're going with versions of fiber arts group) and we decided to do some challenges to get our brains in gear. We spent a good part of a meeting trying to figure out how to choose an idea. Then Kate blew in late with tons of energy and just whipped us all into making a decision. We wrote words on slips of paper and put them in a hat. We drew out two and had our theme....telephone closeness. I was in a pragmatic mood so decided to make a cell phone case. 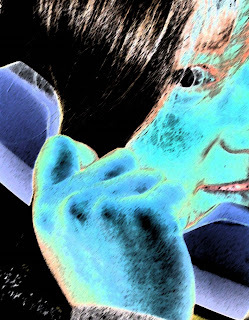 I had Susan Gorman http://www.dandelionfactory.blogspot.com/ take a photo of me holding an old fashioned telephone. I then photoshopped it. I closely cropped the image and then played with the color. I ended up with a blue face with peach highlights. I then printed it out on fabric, which is one of my favorite things to do...it feels like a miracle to have an image come out on fabric. I pulled out all of my fabric and played around with it until I found somepieces I was happy with. I constructed it and then stitched the blazes out of it. I took a quilting class from Susan Shie http://www.turtlemoon.com/ a few years ago so used techniques she taught. I ended up with a pretty cool piece that will keep my telephone close!